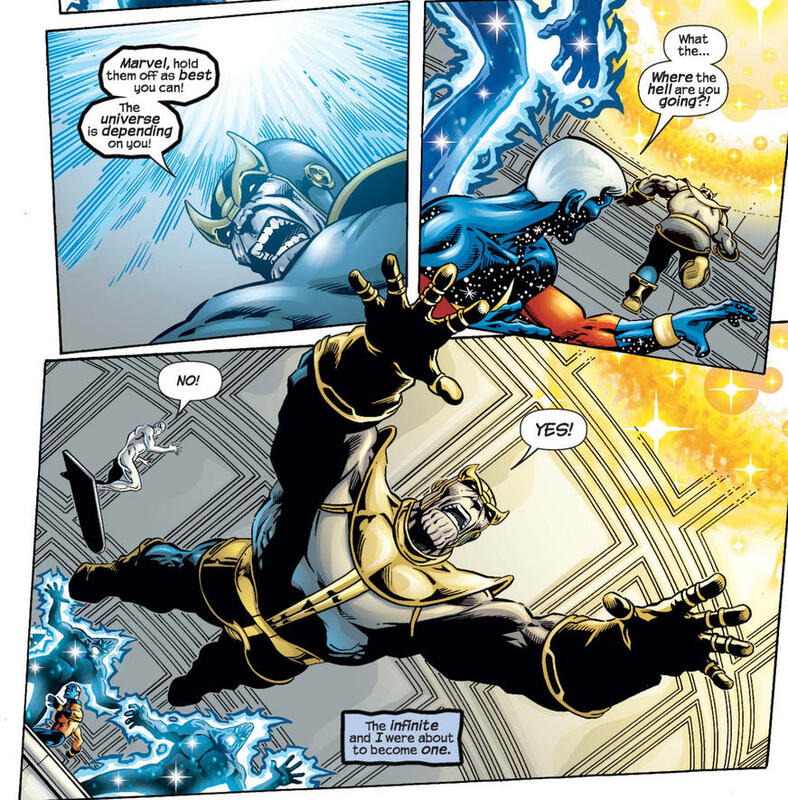 As Cosmic Ghost Rider gets ready to obliterate everything, here's a look back at how Thanos did it -- the first time. The Marvel Universe is filled with countless dimensions and realities. It has been destroyed on multiple occasions, from the early days of the non-canonical WHAT IF…? Comics (specifically issues #31 & #32) to SECRET WARS. It has also been reconstructed on multiple occasions. The time has come again to destroy the MU, this time through its history. In COSMIC GHOST RIDER DESTROYS MARVEL HISTORY #1, written by Nick Giovannetti and Paul Scheer with art by Gerardo Sandoval – on sale Wednesday, March 6 – Cosmic Ghost Rider will be arriving soon to change what Marvel fans thought they knew about -- everything! Let’s compare the upcoming event to MARVEL UNIVERSE: THE END, the one time the Marvel Universe was gone before readers could turn to page one. The culprit in this limited series is none other than Cosmic Ghost Rider’s former boss and “temporarily adopted son,” Thanos. How did Thanos destroy the Marvel Universe? In MARVEL UNIVERSE: THE END #3, Thanos, Captain Marvel and the Defenders teamed up to fight against the Celestial Order, who were responsible for the corrupt pharaoh, Akhenaten. During the battle, after Namor and Doctor Strange were wiped from existence, Thanos gained control of the Heart of the Infinite (or the Heart of the Universe, as Thanos called it). Thanos became so powerful that he rid himself of his enemies with ease – and he had a lot of enemies. Unfortunately, gaining all this power had universal consequences – an imbalance of life and death was created, which triggered the end of the universe. Oops. How will Cosmic Ghost Rider destroy the Marvel Universe? It is not entirely certain, but time traveling will be a component. 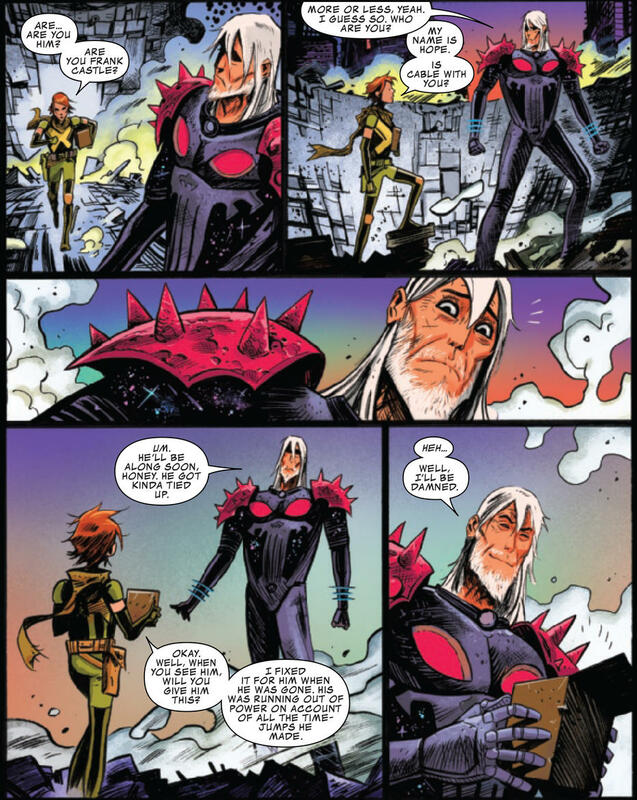 In COSMIC GHOST RIDER #5, Cosmic Ghost Rider obtains Cable’s “time jumper” from Hope Summers, who fixed the tech after Cable overused it fighting the titular character. CGR’s record with time traveling hasn’t been great (creating an alternate timeline in which Thanos is worse than ever before), so with Marvel’s history at his fingertips, it can only spell disaster. Why did Thanos destroy the Marvel Universe? Ironically, the Mad Titan doesn’t want to destroy the universe. He wants to have the ultimate power in order to defeat his enemies, of which, as noted above, he has plenty. Thanos is so paranoid about his enemies besting him that he doesn’t consider the negative effects of fusing with the Heart of the Universe. This also includes losing Death. 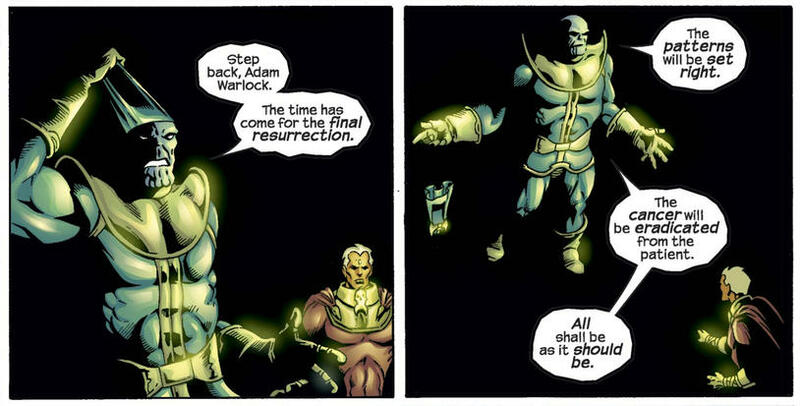 After absorbing the universe into himself and conversing with Adam Warlock (who avoided extinction because he was outside of reality), Thanos decided to sacrifice himself to bring everything back to the way it was. Who knew Thanos was capable of doing good? Why will Cosmic Ghost Rider destroy the Marvel Universe? Cosmic Ghost Rider left Valhalla at the beginning of his self-titled miniseries because he was bored. Is this the reason that leads to the deconstruction of Marvel History? Or is there another reason at play? You’ll have to find out in COSMIC GHOST RIDER DESTROYS MARVEL HISTORY #1! COSMIC GHOST RIDER DESTROYS MARVEL HISTORY #1, written by Nick Giovannetti and Paul Scheer with art by Gerardo Sandoval, goes on sale Wednesday, March 6. Pre-order your copy today online or at your local comic shop!